On January 5, 2017, Alexis was diagnosed with leukemia. She was seven years old. 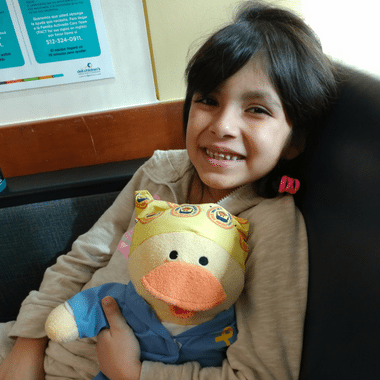 Despite her diagnosis, Alexis found hope and comfort in the Chemo Duck she was given by her doctor at the Children’s Blood and Cancer Center in Austin, Texas. Now, wherever Alexis goes, Pato Lucas goes, too. Alexis uses Pato Lucas to explain her situation to other kids and adults. Having Pato Lucas nearby has helped show her that she’s not alone in her journey. Just as Pato Lucas has been a comfort to Alexis, she has been a comforting friend to others in her situation. Alexis also loves to help out at the clinic by talking to other kids about her experience and the way she sometimes feels about what is happening. When Alexis isn’t spending her days spreading hope and joy to others at the clinic, she can be found spending time with her parents, her brother Luis and her step-siblings Alex, Chris, Kristy and Frankie. Everyone with Gabe’s Chemo Duck Program is so thankful that Alexis was willing to share her story. Her sweet, caring spirit is a gift to us all!